Commercialized college sports is American higher education’s elephant in the room. Although big-time college sports have pervasive effects both on and off campus, this activity has been routinely ignored by scholars and almost never included in university mission statements. 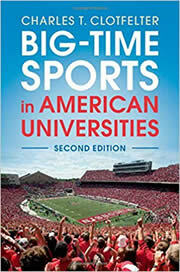 In this second edition, Charles Clotfelter has updated and expanded his groundbreaking examination of American universities’ embrace of commercial sports. The central themes remain intact. Despite their scant connection to research, teaching, or public service, these commercial enterprises are no accident. Nor are they just another extracurricular activity. Instead, they have become, despite their myriad problems, a central and indelible function of the universities where they exist. Thanks to the torrent of money generated by television and widespread fan interest, conference alignments have been upended in a breathless effort to reach more media markets and coaches have become rich and famous. But despite their problems, college sports remains a strong connection between universities and legions of loyal fans.